Can Palliative Care Improve...(Patient Experience of Care, Readmission Penalties, Medicare Spending per Beneficiary, Etc)? I’ve spent quite a bit of time lately figuring out ways to position hospices to partner with health systems, payers and large physician practices to provide palliative care in facilities, clinics and patient homes. Each of these groups – health systems, payers and providers – has something in common, they are all extremely motivated to provide high quality and cost-effective care to individuals and patient populations. The Coalition for Compassionate Care’s Value Snapshots for Palliative Care (Hospice, Inpatient, Clinic and Home-based) provide ample evidence regarding the generalized efficacy of palliative care in improving patient outcomes and/or decreasing costs (depending on the care setting, duration of care, etc). However, convincing potential partners of your ability to address their specific needs relative to their patient population requires more finesse and access to data which is primarily not in the public domain. The Hospital Compare database, which includes data on Patient Experience of Care and Medicare Spending per Beneficiary, combined with data on hospital readmission penalties offer a way for palliative care providers to promote their ability to address the challenges that health systems, payers and providers are facing. How have you (or how might you) used publicly available data to position your organization to solve an organization’s challenges? What other data sources are you using? What compelling arguments have you made (or heard) as to how palliative care reduces readmissions? Best practices in care transitions are core components of palliative care, how can palliative care providers get paid to support care transitions? What role (if any) can palliative care play in delivering services via the new CMS Chronic Care Management reimbursement? Is this a viable revenue stream for palliative care? What do palliative care providers need (other than money) to promote palliative care partnerships to health systems, payers and physician practices? What do you want or need to know about any or all of the above topics? I can't promise to answer all (or any) of these questions, but I’m hoping lots of folks will join me for discussion on these and other related topics. 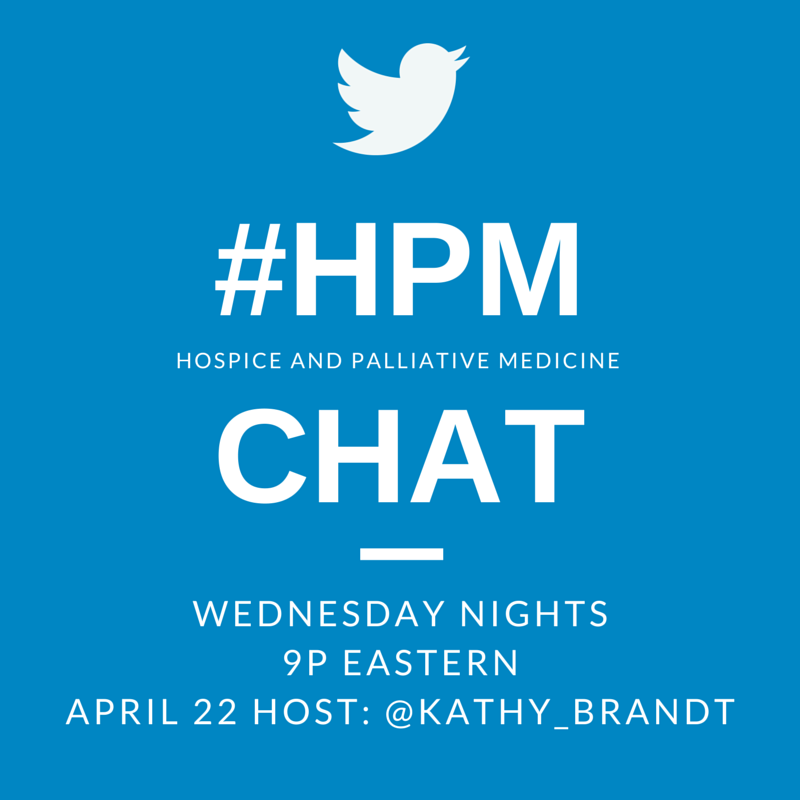 See you Wednesday at 9:00 PM ET on Twitter – just follow the #HPM tweets and join the discussion! We have breaking news, just in... The Role of Palliative Care in Accountable Care Organizations was published online today (4/21) by the American Journal of Managed Care. You never know, the topic of ACOs might come up in our discussion! Kathy Brandt is not a clinician and she doesn’t play one on TV. Kathy has over 25 years working in hospice, palliative care, aging, and caregiving at the national, state, and local level, including 16 years at NHPCO and 7 at Suncoast Hospice. Her firm, the kb group, helps organizations plan, position and promote their palliative care expertise. Cases: Complicated Grief: How Long is Too Long?